I was here at this place when this tragedy happened. My family escaped into the mountains. I visited the site in 1980, at that time you could still see the foundations of the wooden bridge that crossed the Drau. The bridge was the escape route. Mihail (Misha) Krassnow/Krassnov/Krassof-a cook, who worked in the camp kitchen in Peggetz and also was very proficient in making soft leather boots/shoes in his spare time-if there is anyone out there who may possibly have photos of the Peggetz camp/kitchen it would be a godsend as my brother (aged 75) is the only person now who could identify my father from a photo-cheers from Australia! My mother also worked in the kitchen at Camp Peggets. I have a phtograph od her myself and several other men around the large cooking pots in the kitchen. I also have some photos of the school class that i attended . Your brother is 5 years older than I I would be glad to send tyou copy of these as well. Who know he may have been one of my class mates. I shall return to Toronto Canada around the end of september. If you wish to see a copy of this kitchen in Peggets I wil be glad to send it you. Un drama bochornoso olvidado por unos y ocultado por otros para verguenza de los responsablles de la tragedia, sobre el que escribí ,en su memoria en1993, un artículo titulado "Los que no existieron"
Thanks for the photos...I am 37 and live now in Poland but me and my wife are White Russian and Belarusian. As great-grandchildren of the Last Tzar's officers we want to visit the place to show our two sons Nikolay and Simon the part of our history. Thank you so much for replying-I know you will understand just how much a copy of any photos would mean to me (us)-just possibly we may find who we are looking for. As an original Austrian I don't know why but I allways felt a special affinity to Russia and espcially to the kosaks, the monarchy and the orthodoxian church. Nevertheless I feel as an austrian patriot and I am a member of a traditional cavallery regiment, the 3 rd Dragoon Regiment of Vienna. Whenever you visit austria to keep kontakt to your history, your identity call me if you need help or any contact. We are not long back from Europe where we spent six lovely days in Lienz(where I was born) and were fortunate to participate in the Commemoration of the 'Tragedy on the Drau'-65th Anniversary of 1st June, 1945. There were many cossacks in Austria at that time and unfortunately many died there or were forcibly handed back to the Russians against their will by the British. Thank you for your offer of help as I still have a lot of personal research to do. massacre/betrayal. Is there anyone that was in the Kellerberg camp, which came after the Lienz/Peggetz event. I was in that camp until 1950 and have many photo's. There is no trace left of the Kellerberg camp. I am writing from Australia. How old were you when you left Kellerberg and where did you go? There is a lot of information on the various camps plus photos on the website dpcamps.org and they also include the contact details of the many people who are also looking for information and lost relatives. Good luck!. I was 5 years old and was sent to England. My parents had been sent there a few years earlier. I lived with my grandparents while in the camp, later they were sent to the USA. My uncle was sent to Canada. It took us 12 years to reunite the family, which we did in the USA. Did your grandparents experience the tragedy of Lienz-I was born in Lienz and was two and ten months when we arrived in Sydney Australia in June of 1949. Whereabouts in the States did you settle-I know my godmother went to the USA (Rochester) near New York I believe but I only know her maiden name and have not been able to trace her or any of her family-she would be very elderly now or possibly even deceased. Hope you are successful in finding others who remember or know of Kellerberg. My grandparents, mother, uncle and I all went through the Lienz tragedy. I was only one year old at the time. Fortunately the entire family managed to escape the British soldiers and hide in the mountains. After months of living in the forest, the Brits offered safe haven in the Kellerberg camp. As a child I used to hear my parents talk about their experiences at Lienz. As an adult, through travel and research I have found that the stories were all true. We settled in New Jersey. Did your grandparents, uncle possibly have any connection with the former Yugoslavia. Yes, many took to the mountains until it was safe to come back. We met in Lienz with the now Ataman of the All Cossack Association outside Russia-Alexander Pewnew, also of New Jersey and are you aware that the people of Lienz have started an Association to preserve longterm the commemoration of this Tragedy and are in the process of planning the building of a Museum. I guess your story would also be a long one with many twists and turns-not a wonder that those who managed to survive the events of that period focused so whole heartedly on their new freedom and re-establishing in their new 'homelands' and sometimes choosing to never talk about the past. Such tenacity and strength of character. I was born in Serbia, My grandfather was a Kuban cossack who after the civil war in Russia settled in Serbia.The entire family made that walk from Italy through the alps and into Lienz, Austria. I know of the "All Cossack Association Outside of Russia" and have been to their church and museum. Unfortunately as time goes by there are fewer people left who have a direct connection to that period of history. I am the last one in my family that directly experienced Lienz and all that followed. I do make it a point to let my children know what happened back then and why it happened. So all is not lost. I was not successful on this website in connecting with Nicholas (above) but we have exchanged emails now and are corresponding. I would love to know your story-my brother and sister were born in Novi Sad and their father was in the Russki Corpus there. Thank you for your interest in my book and sharing your story. What I find striking about our parents is that despite the horrors of war and its aftermath, people survived and continued to be loving, happy, caring people. Our parents left their homelands so they could give us a better life—they were heroes and that is why it is important to preserve their stories. Our place in history is unique; having lost everything, we rebuilt our lives and that is another striking story – I am amazed that, despite starting with nothing, the vast majority of the DP children have become highly successful, productive people, contributing to the betterment of humanity. We didn’t wallow in self-pity or demand that our adopted countries bend to our wishes. We never felt entitled to anything – it was the other way around: we wanted to contribute to our new homelands, grateful that we were here. It would be nice if there could be a reunion of the children born during one of the most tumultuous times in world history. We have many stories to tell and legacies to leave. We have a common bond and are the last of the DP generation. I hope we can have a reunion of all children born in the DP camps, as a way to have closure to the era when we were all waiting to know what would become of us. If you know any former DPs that are interested in a reunion, please have them contact me. Best wishes to you in all of your endeavors. Thanks for your kind message and I apologise for not replying sooner. It always strengthens my hope of eventually filling in the blanks when I hear from someone who has been able to do just that. I have been told by ‘Santa’ that your book will be under the tree this Christmas and very much look forward to reading your story. My brother (80 next year) lives with his own memories and shares what he can but has said that there are some things he just cannot share with anyone. Hopefully with time, it may surface. Over the last 12 years I too have accumulated a wealth of information thanks to my husband (chief researcher) and the many contacts we have made. People are very generous with their information and help and we have been able to re-unite a couple of our internet friends with their lost relatives here in Australia, quite by chance. 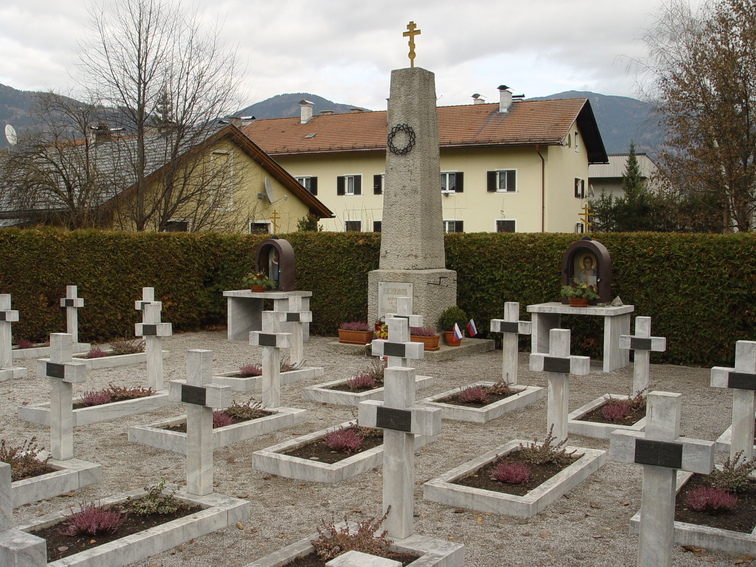 We have been lucky to visit Lienz in Austria a couple of times for the 1st June commemorations there. With the grace of God all my findings will become my own legacy to the memory of my family (my Mum, brother and sister) and our Australian generation, my own children, grandchildren, nieces and nephews. I came across your message on the DP Camps website and wanted to let you know that I was born in the Altenstadt DP Camp in 1948. My father disappeared shortly after my birth in war-torn Germany and it took me 43 years to find him. I wrote a book about it, The Night Sky: A Journey from Dachau to Denver and Back. I too came to Lienz via the Cossack exodus from Italy when I was about one-year old. My father was an Cossack officer, repatriated and probably died around 1945. Some kind Austrians hid my mother (Nina Polycarpavna) and her sister (Eugenia Polycarpavna)and me in the mountains in exchange for some jewelry and an English officer helped my mother and aunt return to Lienz and then helped them move to England - they were both exceptionally beautiful and very young so I am sure it helped a lot. I stayed in Austria with Trudel and Alexander, owners of a small hotel in Leinz. I wish I could remember their last name as I would like to get in contact with their children. My mother had the Red Cross bring me to England, were I had a wonderful life, great education and was happy. I married an American and now live in Florida. My mother rarely talks about those times and doesn't like me to question her too much. But I would love to know what happened to my father and grandparents (Polycarp and Polina Avramenko). Wonderful to hear from you. My mother, elder sister and brother also spent time on a farm in Mena, Italy. Please feel free to email me direct, if you wish, email appears aboveon Maria's last post. As you well know the common thread of 'not talking' is still alive and well. If it wasn't for my brother and sister I would still be in the dark about my own history. Please don't lose time and try and talk to your Mum. I didn't get the chance and feel that maybe there was a fear of rejection from me, maybe guilt, protection of me or simply 'what was the point' after all the years that had elapsed and I was happy in my marriage. It is hard to explain to someone who knows all their family history how you feel when you don't know and that is also a common thread of those of us born during or after the war. Is it possible that your Aunt could help. If your Mum is in reasonable health and you can talk to her try and make a few approaches.................you do have a right to know after all. I have gone over the conversation so many times that I would have liked to have had with my Mum.............I wish I could have told her how sorry I was that she had to go through what she did. How much I was in awe of her strength of conviction to hold on to the three of us no matter what and above all else that I held no bitterness or resentment towards her and I would never give judgement to anything that happened because of the circumstances of the time.......................as I have no way of knowing how I would have coped having to face the same hardships. Once she opens up a little it will just flow and you will probably find it will not be in sequence but just as she remembers things. My brother has just turned 80 and after 14 years there are still new things coming out. If the conversation doesn't happen, please keep in touch and I will try and help as much as I can. Trudel and Alexander shouldn't be hard to track down. Let me know whether you have done any searching yet and whether you have any info at all. It's been a while but Hi to everyone again-wanted to let you all know that we (four of us from Sydney) are going to be in Lienz Austria this year for the 70th commemorations and should any of you by some chance also be there, please make yourself known to us. Our Aussie accent will no doubt give us away. We are staying at the Sonne Best Western Hotel. Fondest regards to you all!. I am very happy for you. I have a friend from Australia that will also be attending at Lienz, Austria. I will be attending a commemoration ceremony at the Cossack Chapel, St Vladimir's Cemetery on 7 June in Jackson, NJ. USA. I notified my friend Vladimir Selepouchin and he will also be in attendance. I was born at Kellerberg after Lienz and have yet to return. Maybe next year. Best wishes and keep us informed. Happy to know you! We are just home now after some four weeks in Europe. My personal email address appears on this site above. Would love to hear your story. Have some photos of this years commemorations and blessing of the new chapel on the grounds of the cemetery which I would be happy to share . We spent a lot of our time with the Pewnev family also from New Jersey. You may know them,. We are connected by fate-Alexander's sister lives here in Australia and our families have been strongly connected since arriving here together on 22nd June. 1949. I would like to add what I know about my family's history in Lienz. My father (who died in 2008) was a boy in the camp (Peggetz?) with his parents, two sisters and brother. In Russia, the last name is Izvarin (changed to Isvarin at some point) and they also went by the name of Iswarienko (because I was told it was safer to be thought of as Ukranian than Don Cossack Russian). They came from the Rostov oblast (I think from the small town of Morozovsk or Morozovskaya). They ended up in the camp and escaped into the mountains on that awful day of June 1, 1945. My dad recalled (and I read another account) of seeing a woman with a baby strapped to her chest jump into the river instead of being captured and repatriated. I wonder if they say the same woman or if there was another. So sad! My dad told me stories of he and other boys running from barracks to barracks, avoiding the search light, to get to a hole in the fence where they would leave the camp and steal from farmers (food, blankets) for survival. I would love to get in contact with other people (or their family members) who lived at the camp and are willing to share stories. I hope to go to Lienz someday to pay my respects to those who lost their lives. I was born and raised in the Cleveland, OH area and have been doing genealogical research off and on for years and this is one piece I research. Everything you have spoken about is so common to those who were there on the day and after. My darling sister who passed away some 16 years ago was named Natalia. The photo has been viewed 4205 times.